How will he know if a car is coming if he's listening to his iPod while crossing the street?!????!?!!!! My darling PG, you never miss a beat, even in the face of devastating hoaxes! You rock, girl! You know, I think I'm getting used to getting new old pics and they are really quite nice. 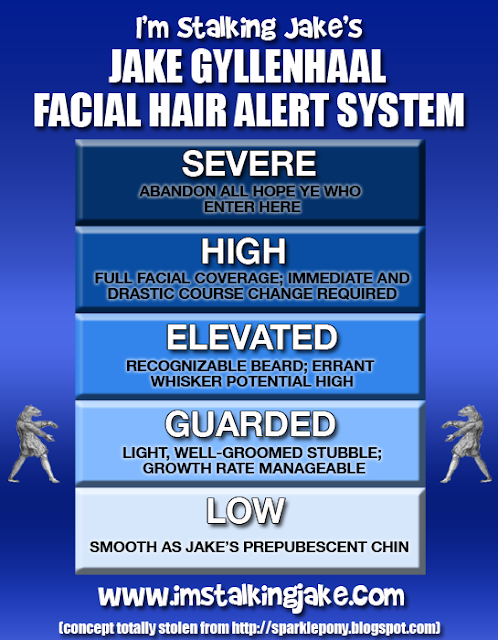 That hair and scruff is just perfect and I'm afraid he'll look like Grizzly Adams by the time we get new pics. This way like turning my life support back on! 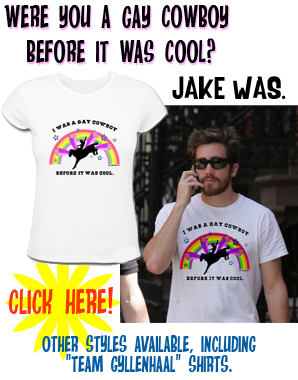 Oh, I so concur with gyllenhaalisgr8, PG, you TOTALLY rock!!! I was so freaked earlier & had worked myself into a silly frenzy that I just had to go back to a fun place to get myself out of it here > Uh oh. Has Jake Gyllenhaal turned into a WEREWOLF????? Icon? Was that post meant for me? Hmmm. If you mean my Blingee pic, YOU inspired it with your twitter pic! It was my first Jake Blingee response to your "assignment". Thought it was appropriate for the blog! Thanks!! Thank's your kindness. I was relieved at this post. I love your wisely humorouse sence! The people who started jake's death rumor would't get forgiveness. 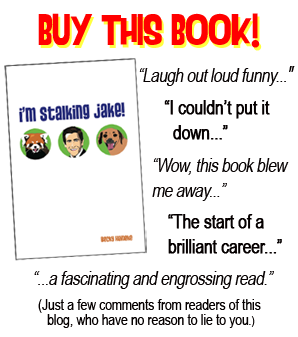 I love your Jake Blingee -- whenever I see it, it makes me smile! A preview of LOAD will be on Entertainment Tonight, tonight. YAY for Love and Other Drugs!! Alright, I'm totally live-blogging Entertainment Tonight then. RE THE BOOK, the short answer is SOON. I can't tell you how frustrated I am that I still can't give a specific date...but it IS with the design team right now and it should be 5 or 6 weeks. I wish like hell I had more concrete news, but all I can say is that it's coming and I hope you're all still interested when it's finally out. I CAN'T WAIT for people to read it; I just can't seem to get the publishing company to publish the damn thing at anything other than a snail's pace... Argh. Wow, I'm gone for 2 days and so much happens in Jake's world. Anon - DANG. I DON'T HAVE ET IN HK. Why can't this stuff play when I get back in the US? Someone please record and upload this! KeepCalm - SPAIN. So awesome. How was it? I'll probably be perusing Spain next year around June after I visit Morocco. Any suggestions? And since I didn't really comment on the whole Jake Death thing, I will do that now quickly. IE: THIS IS WHY I AVOID TWITTER LIKE THE PLAGUE. And after reading what I said about Seville being more city and more bar, I feel totally stupid as Seville IS a city so of course there'll be more bars. cool. Sounds like it was an amazing vacation! Though that's REALLY hot. But hot that comes with a tan is alright. :D Good luck with the flamenco lessons; that sounds like so much fun! I will happily scout out the locations! When we planned to go to Morocco, that was one of the first things I thought of! Maybe KD and I will somehow meet, draw together by Jake ;D Omg it was so so hot but then isn't it hot in the US? Sorry for my complete ignorance, I've never been (another holiday for next year). No, you're absolutely right, IT'S SO HOT. That's why I feel your pain! We're actually in the middle of a horrible heat wave in the South right now. For most of last week, our heat index was around 120 (which I just converted, and that's 49). People are literally dropping dead every day from the heat. FORTY NINE?! Omfg. That would have killed me off. How do you deal with that?! I think it's like that in Russia; something like 700 people a week are dying. How cheery! I'll have to find out when shes going and where because I think I'm going to Marrakech which is where Rendition was filmed and its highly likely I won't be able to handle the heat there either! OMG HE LOOKS AMAZING! I Always say Jake gets better with age, but these old pics- woah!! !